The Villerville–Cricqueboeuf landslide (Normandy, France) is an example of a very well monitored coastal landslide. The long time series goes back to the 1980s initiated after the January 1982 major re-activation of the landslide complex. The combination of translational movement of large blocks of chalk and sandstone and the rotational movement at the cliff’s toe results in a very complex hydrological system. Earlier research showed a qualitative connection of displacement or re-activation with meteorological forcing and inland hydrological circumstances. This study aims to analyse the hydrological processes within the larger landslide area and quantifies the hydro-meteorological triggering thresholds. Long-term continuous single point time series and shorter more spatially distributed information were used for the analysis. A conceptual water balance approach on monthly time scale was used to model the regional groundwater system showing a clear non-linear response at higher groundwater levels. 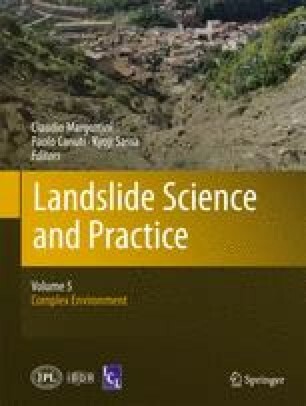 An empirical rainfall threshold for landslide re-activation was proposed using rainfall and inland groundwater level as proxy for antecedent conditions. This research was funded through the ANR Risk-Nat project ‘SISCA: Système intégré de Surveillance de Crises de glissements de terrain argileux’ (2009–2011).